I’d been starting to get on a run of niceish locations, and Escape Rooms was no different. It’s located just off Tooley Street, near London Bridge. It seemed like a well laid out venue, with great use of space. Upstairs there’s a single (normal) room where they greet you and say their farewells, decorated with photos of past escapers and with rubik’s cubes for you to play with while you’re waiting. Downstairs they have two rooms – this one and another Egyptian themed room. 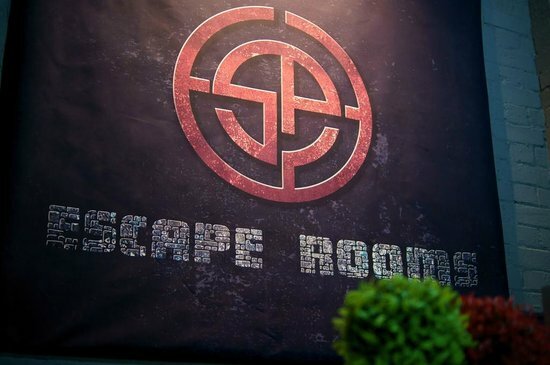 Our host was incredibly friendly and happy to talk about escape rooms with us – it really makes a big difference to my experience if there’s someone who’ll take the time to chat through the game with me afterwards. Plus, they let you put your photo up on the wall if you escape, which is a nice touch. You’re one of the Emperor’s soldiers in the somethingth century, and in charge of guarding the Emperor’s most prized possessions. Apparently you’ve not done a very good job of it though, because his favourite vase was stolen. Fortunately though, you’ve found your way through a time portal to the 20th century, where the vase is located in the British Museum. Room 33 to be precise. Your only hope is to get in, steal the vase and then escape before 60 minutes pass and the portal closes. What makes a good room? Good puzzles are one aspect – in fact, probably two. I’d consider a good room would have a wide variety of interesting puzzles, but also have a couple of them that truly stand out. That could be because of an impressive piece of technology, beautifully engineered clues, clever solutions or they could stand out in some other way which escapes me at the moment. I also like to have puzzles which involve the whole team – either physically requiring multiple people, or where the puzzle has a mixture of clues that is likely to bring everyone into the solution. I like the puzzles to be themed, the room to look beautiful (ideally without too much clutter), and the clue pieces to feel natural. Room 33 meets all those requirements. From the moment you step through that door, you know you’re involved in something special. I have to admit that I felt they’d made a significant error putting a “wow” puzzle right at the start, but that was before I realised that there was a second “wow” puzzle in the middle of the game. Indeed, they continually threw in puzzles that would have been the highlight of other rooms. When I finally came to that second “wow” puzzle I seriously paused just to play with it for a few seconds, before mentally dragging myself back to the task at hand. We set the record on this game (second or third time running we’d done that I think), which was especially impressive, given that I went along with almost rookies (two games between the three of them). More importantly, we got to hang our picture in pride of place at the top of the stairs! This is a “must do” room. If you’re only going to go to one escape room in London, then it’s this one, or ClueQuest one of a handful I’d recommend: choose one of the five star rated rooms on this page. If you’re an experienced player, then what’s taken you so long? Get on down and try it out. We headed to the George Inn after playing, for what turned out to be a decent, but not amazing, meal. If you’ve never been to this pub, then I highly recommend it, for the aesthetics if nothing else. It’s the last remaining galleried inn in London, and has a delightful warren of rooms to drink in, as well as a large al fresco cobbled yard out the front. Next Post: Secret Studio: Escape in Time! Hey! I just did this last night and I’m curious…do you still think it’s a 5-star room? I mean, I know you can’t just go in and change the rating a year later but I didn’t think it was that impressive. Maybe because of the high expectations (entirely your fault :)) maybe we have just done too many great ones, aside from the first room I thought this was probably a 4-star room at max. I didn’t think it was particularly difficult, the props are really worn out (I know it does with time but still) and apart from the two neat technical things (beginning and remote control) it was just ok. Or maybe I wasn’t that impressed by the decor because I’m Chinese and have seen the decor a million times…hm. Yes, this is one of the rooms that I most worry about. I played it early on, so had less to compare it against and it’s long enough ago that it’s hard to remember it well enough to compare. I do like technology, the physical challenge was exciting for me, the host was great, I felt the puzzles were tougher than other rooms and at the time I didn’t care as much about decor so pretty things to look at were good. As ever – thanks for the comment!